Children and adults with disabilities have the opportunity to try a variety of software and assistive technology devices. STC staff assist parents, their children, and professionals attending the session to experiment with software and hardware. Together, they find ways the individual can benefit from technology. Individualized training sessions provide consumers, families, and professionals with focused training on newly purchased software programs. 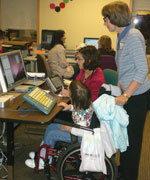 The Library offers Minnesota families and professionals the opportunity to preview educational and disability-specific software and assistive technology devices for children and young adults. Find equipment and assistive technology after its initial use. Items such as, communication devices, walkers, adaptive switches and toys, motorized cars (that can be adapted), adapted keyboards, etc. The STC provides free, public workshops for parents and professionals on a variety of technology-related topics. Corporations, professional organizations, and parent groups can also request customized in-services (available for a small fee).